Colombina in Italian means “little dove.” She is a character in the Commedia dell’Arte, a mistress to Harlequin, a clever and funny maid-servant and a wife to Pierrot. She is often the only intelligent person on stage. 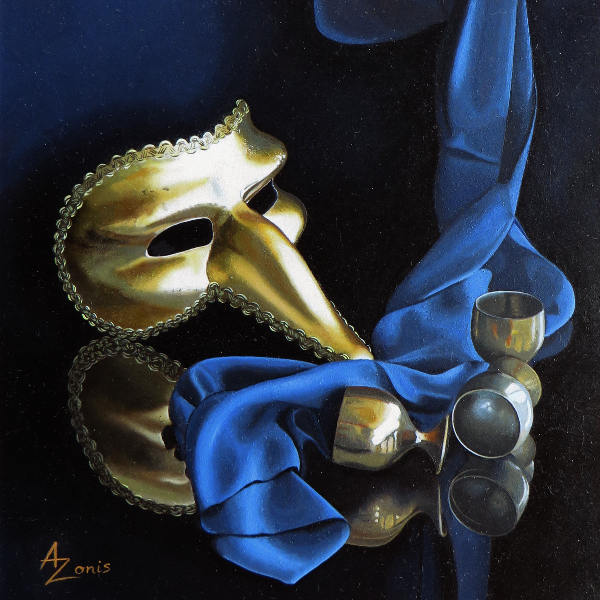 Venetian carnival mask of the same name reflects heavy eye makeup play character Colombina wears on stage. This little painting is the 5th in my series Phantasmagoria. I painted it in 6”x6” size as it was meant for Randy Higbee’s 6”Squared show in December 2015, but it never made it there. I had to travel and live overseas for 2 months to be with my family during my father’s illness and passing. The little half-finished Colombina sat on my easel and waited for me to return to her. 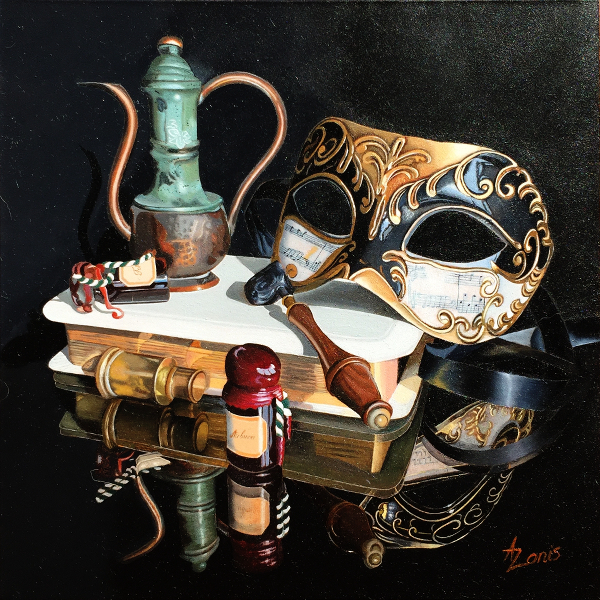 She was a little trickster indeed, it took me some time to work out her intricacies, curlicues, ribbons and gold. Of course this is the main idea behind the title and the painting. Sometime when I am long gone, and my paintings would command exorbitant prices, and museums would be fighting for them (dreams are allowed 🙂 !! ), then art historians will be scratching their heads about what did I mean by this image and coming up with their usual nonsense. To spare them this awful fate, I’ll explain :). This is a Venetian carnival mask called Medico Della Peste, translated Plaque Doctor. Back then in medieval time they began to realize that medics needs some kind of protection when attending the sick, and a mask of this configuration was used cover a face. A scary thought! Centuries later it transformed into a carnival mask, if a little macabre. The draped dark silk and upturned goblets hopefully add to the dark carnival mood. But there is more to this fabric, this is a blue scarf that I wore as a teenager back in Russia in Kishinev. God only knows how I still have it decades later and continents away, but I do. So when I wanted blue for color composition, I remembered it. Almost every painting I paint has a hidden meaning or a little joke that I keep for myself, for my private entertainment and chuckle. This blue scarf is a reference to my own self in a different time and a different world, when I knew frighteningly little and possibilities were so big. All That Glitters is the 4th painting for my series Phantasmagoria. This painting was in the works seemingly forever. I painted Noh back in 2011, I think. 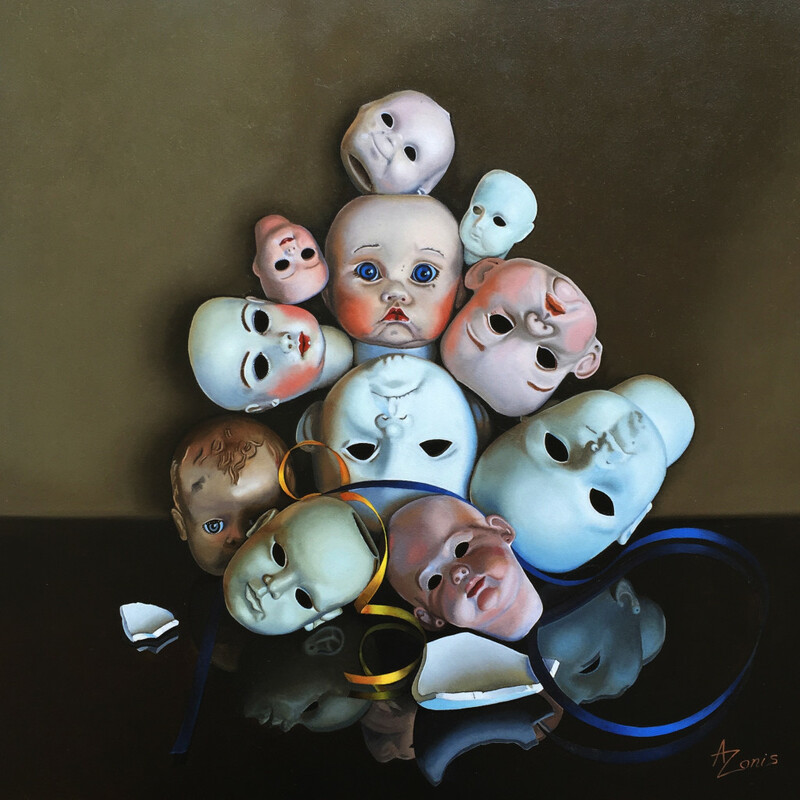 Ever since then I’ve been looking for doll heads to paint more of them. I finally found a treasure trove of them early this year, 2015. And then, in a way it often happens when the right time has come, the husband asked for a new work for the cover of his new book. I started working on ideas and this composition resulted. It took two and a half months to paint. It is the most complex work I have ever done to date. Even more complex than Adagio for Three Strings! But then, as my daughter pointed out, I always say this. We will send Group Portrait to the publishing house shortly and hope that it will get approved as cover art for Phenomenology of Empathy by Lou Agosta. It is also another installment for my new series Phantasmagory. More often than not these paper paintings take longer than I anticipate. Or hope! I think this one took two months. But I am not entirely sure, and am afraid to investigate. What if it took 3 months? Regardless, it is now complete and drying. There are are couple of things to mention about this painting. This is my first try working on Dibond surface. Dibond is a two ply aluminum panel used for signs. It can be gessoed and used as painting subtract. I really like it and hope to use it for most of my work. It is smoother and less absorbent than Gessobord. Lovely surface! I took the level of complexity up a notch with this painting. Crinkled music paper is great fun to paint! My gallery will be happy, I hope :). He loves complexity! I finished this little painting of cherries in a paper bag last week. This is another installment for the Unwrapped show I’ve been painting for. It came out a nice and shiny little painting, but all I had for it in terms of a title was dull and boring. So I posted the painting on FB and opened it for crowd-sourching for the title. My friends just ROCK! In 24 hours I had a different problem – too many brilliant titles. 40 to be exact, almost impossible to choose because there were so many good and clever ones. They even created a bit of a rift here in the studio as my husband, my daughter and I had different favorites. In the end I did the deciding – it is my painting LOL! Thorns on Paper is a second commission for Mostly Glass gallery and another painting for the Crinkled Paper show planned for this year end. I’ve been working on this painting since April, it took nearly three months, longer than I hoped. I am happy to finish and sign it. And it did not help the matter that towards the end a scratch appeared on a finished background. Could have been Elvis’ work, or I might have gotten careless for a moment – hard to tell. I could not repair it and had to repaint the background. About the title: Everyone who talked about this painting so far calls it “Caravaggio”, which seems to be an intuitive thing to do given the book title painted in the front. Natural that it may be I find it a bit presumptuous. I titled the painting Thorns on Paper to reflect on the painting on the book cover Crowning with Thorns.